White dots = The small dimples on the cam gears. Yellow dots = Roll pins through the links holding the chain together. Red lines = Where the respective dimple on the cam gear should "pass through" the chain. This line demonstrates how many links/roll pins etc... should be in between each dimple on the cam gear. Green circles = The keyhole on the cam gear where the dowel pin on each cam will fit into. Note the orientation. This is with the engine at TDC (Top-Dead-Center) for Cylinder # 1. It is not at TRUE TDC because the chain links are in a different part, but for all educational purposes, it will look like this with Cylinder #1 at TDC. 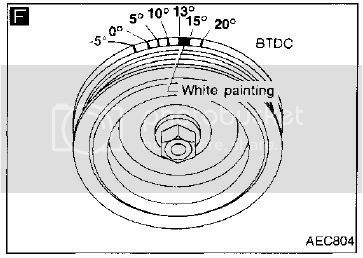 If you have a pulley that is aftermarket, check which hash marks represent what numbers of timing. (Note: Sometimes the stock pulley can separate and give false readings. On the B14 OEM pulley, the 2nd hash mark from the left represents 0* or TDC at the crank. Once again, you want the pin that is stick out from the block to be right on top of the 0 degree mark. Last edited by Kyle on 2012-12-13 at 05-19-13. Note this is with #1 cylinder at TDC with cam lobes facing outwards on #1 cylinder. 1996 200SX SE-R Slowly geting the boost-treatment. Easy rule when going turbo.... upgrade EVERYTHING. Because eventually you will need to. Word! Thanks for this. I was just about to search for it. 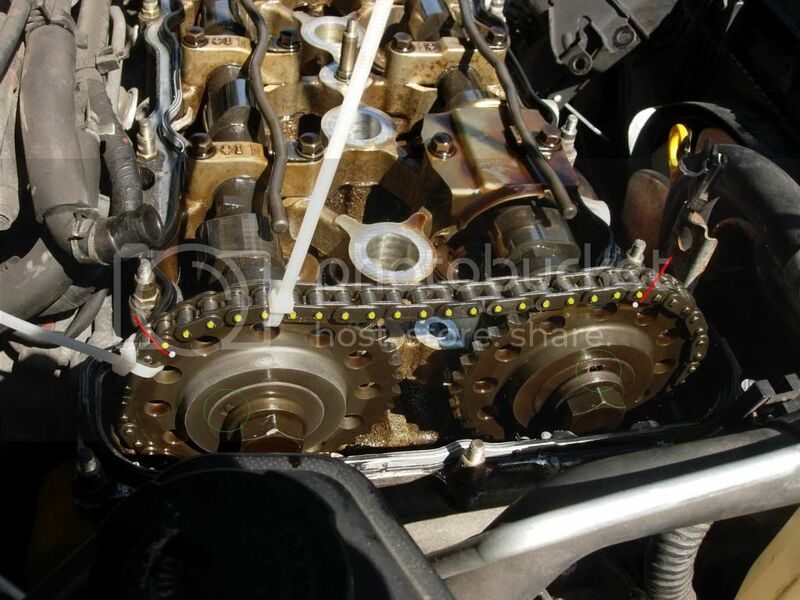 If you can't understand this by now, just put the valve cover back on...you are in above your head! I hope it helps many more from ruining some nice engines. I wish I had seen this a few weeks ago. You should post some pics of the crank too since you have to line it up with the markers on the pulley. I usually throw a big screwdriver or collapsing magnetic stick in the first cylinder too. I usually pull all 4 lugs so the motor is easier to turn over but thats just me. you just have to clean up a bit first so nothing falls into the cylinders. Your motor has a bit of sheen to it and that is pretty normal. I almost trust a motor that has a bit of a tan more than a clean one. Last edited by Benito Malito on 2011-05-27 at 07-04-11. You should post some pics of the crank too since you have to line it up with the markers on the pulley. I usually throw a big screwdriver or collapsing magnetic stick in the first cylinder too. I usually pull all 4 plugs so the motor is easier to turn over but thats just me. you just have to clean up a bit first so nothing falls into the cylinders. All good and helpful points, thread has been adjusted. She is not bad for being 205,000 miles on original engine/headgasket. Just opened the valve cover up a few times, changed cams, changed the water pump last winter and she still nets around 27-30 MPG each week. I love it! Oil changes every 3,000 miles keeps the nasty gunk away. What matters (to some degree or not) are all of he points of reference being displayed in your engine as in the picture I gave. The marks on the chain will line up when everything is at TRUE top dead center.